Download the WSO NewsLetters by clicking on an image below. The PDF opens in a new window for ease of viewing and printing. 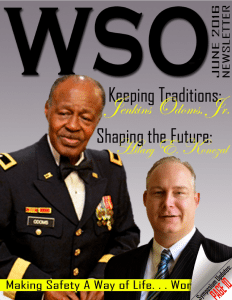 WSO NewsLetters, World Safety Journals, eNews, and Announcements are distributed to WSO Members. If you are not yet a WSO member and would like to be added to WSO’s email list, please complete the form at the bottom of the page. SUBSCRIBE to WSO eNews and Announcements! NOTE: WSO Members do not need to subscribe. Would you like information on the WSO Membership & Certification Program? WSO’s Membership & Certifications Coordinator will email information to you soon! To be sure you receive, please “membership@worldsafety.org” to your safe senders list.